Heya Everyone, so let's get right to it. Now while I understand why they would do this, I would like to suggest another option. 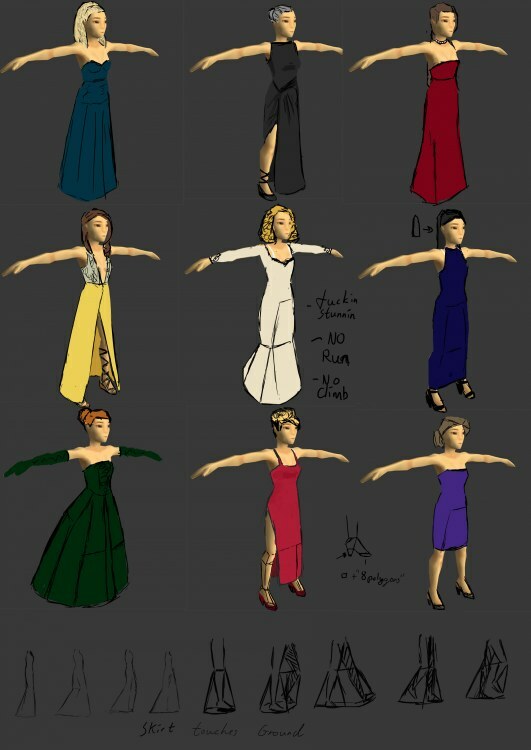 Now before you go crazy, there are some restrictive and some not-restrictive dresses, the 1st, 3rd, 4th and 6th are probably the most restrictive and I would suggest making it so you can only walk in them (or crouch, but no running) which makes it so we won't see clipping, but holding the bottom of the dress to the ground (as shown on the bottom "animation", that way it seems much more like dresses instead of big pants which only really look good if you're standing still. 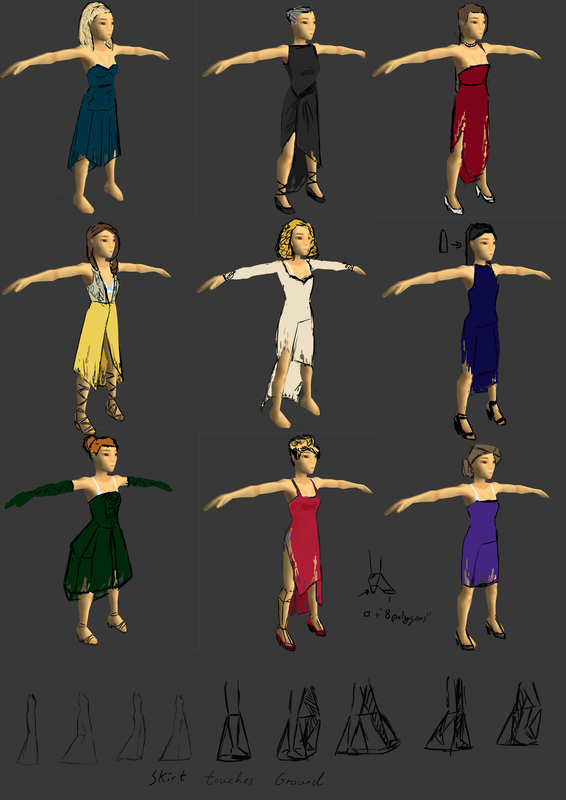 I would suggest animating the dresses (or part of them, to just drag along the ground, thinking along something like the Villager (woman) from Warcraft 3 if anyone can remember, it seems much more like a dress and doesn't break the aesthetics of the game. So wearing a beautiful dress would let you look stunning, but would restrict you to walking/crouching, and maybe climbing through a window, but never down/up ropes or any of the other crazier animations. And if things become grim you can always just rip it and suddenly you can do all the normal things you could do before. Just please, let's not go the route of big trumpet pants, then I rather you just keep to dresses like the dark blue which is just a polygon in between the legs. Part of the animation update is also restructuring the character skeleton. I've added 4 bones (2 at the back, 2 at the front) that control the dress between the legs. This affords some control and flexibility over clipping. Also heels probably won't make it (as a model anyways) as the feet are not detailed enough. But who would wear a dress and heels in a zombie outbreak?